I am fussy when it comes to burgers. If you mention a burger to me I immediately think poor quality. I will only usually eat a burger if I make them myself and know exactly what is inside. 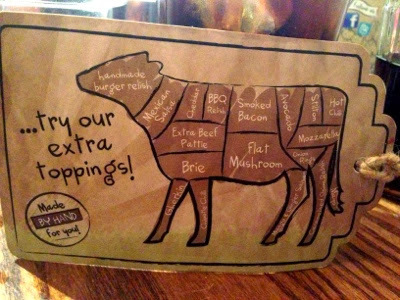 My children however love them so when we were invited to see what The handmade burger co. had to offer, I was intrigued. We visited the Gateshead branch which is situated in the Qube area of the metrocentre. 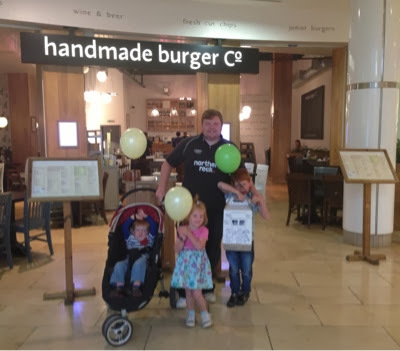 We received a very warm welcome and were taken through the menu which boasts 40+ homemade burgers by a very knowledgable member of staff. 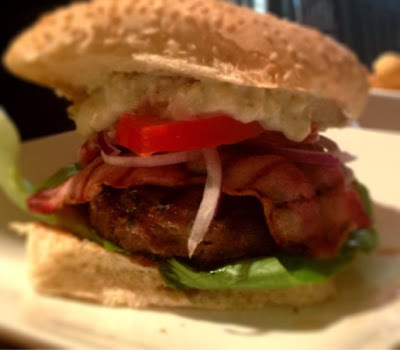 The handmade burger co.'s USP is that their burgers are made daily on site. No waiting for deliveries of frozen pre-made burgers here. They also pride themselves that all of their meat is fully traceable and they regularly meet their suppliers at source which is good to hear. The menu is substantial and you can chop and change anything you like, meaning the combinations are endless and their should be something to please everyone. 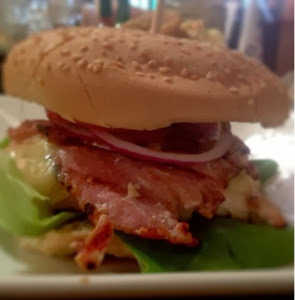 I decided to opt for the waiter's recommendation of a BBQ chicken burger with cheese and bacon whilst hubby opted for a beef burger with blue cheese. 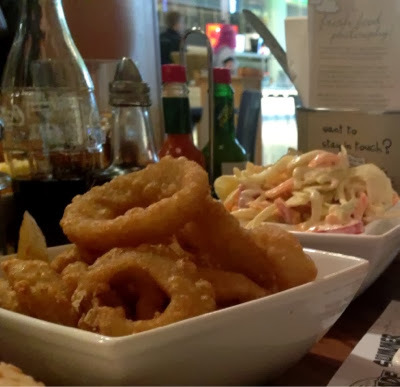 Sides are charged as an extra - we went for chips, onion rings and homemade coleslaw to share between us. 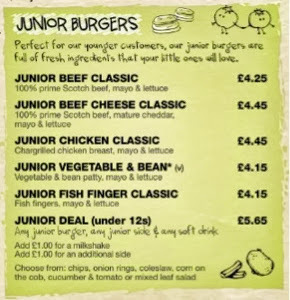 Children are very well catered for at the handmade burger co. A meal deal is £5.65 which considering all of the food is made fresh on the premises I find to be good value for money. I'd rather pay a little extra knowing my children are eating good quality food rather than some re-formed frozen chicken nuggets that have been chucked in a fryer for 5 minutes! For £5.65 children can choose a main, side and any soft drink. The portions are generous and again you can add or take away any toppings. If your child would prefer ketchup to mayo - no problem. We opted for the chicken classic, fish finger and cheese burger deal. 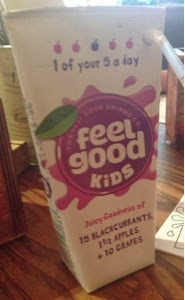 I am pleased to say that all of the food was delicious (we especially enjoyed the chicken burger - so much so that hubby wants to try the grown ups version of this next time) and I was impressed to see juice as part of this deal that is one of your 5 a day too. Children are kept entertained with a small activity pack, crayons and balloons. You can even draw a picture and pop it on the restaurant's wall of fame which was a nice touch. Our food arrived within 15 minutes and I was super impressed with the quality and quantity. The burger's were packed full of flavour. They are priced between £6-£9 but they are HUGE so this is a fair price. You can opt for a smaller (and cheaper) burger if you have a small appetite. The burgers were rather messy to eat though so you might not want to visit on a first date! It was all part of the fun though and not a problem in the informal, friendly atmosphere. The burger's were really delicious but surprisingly, the star of the show for me were the sides. The portions are again on the generous side and one portion would definitely serve 2-3 people. 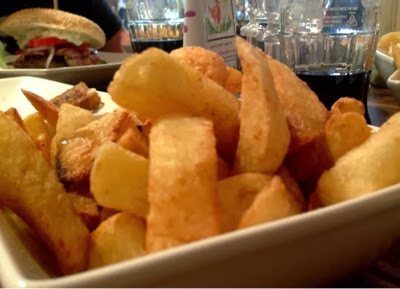 The chips are all handmade on the premises and are twice cooked. They really are homemade which is so rare to find in a chain restaurant these days. Chips like these make you want to go back for more. The onion rings and handmade coleslaw were also top notch. It's safe to say that the handmade burger co. has converted me! I have actually been craving their burgers since I left. 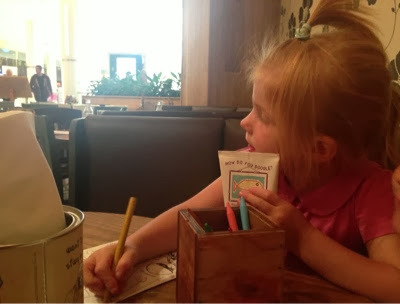 Next time we are looking for a satisfying meal when out and about with the family, we will definitely be returning. I want to give the lamb and mint burger a try next! Disclaimer - our meal was complimentary for the purpose of this review however as always I have been un-biased in my opinion.